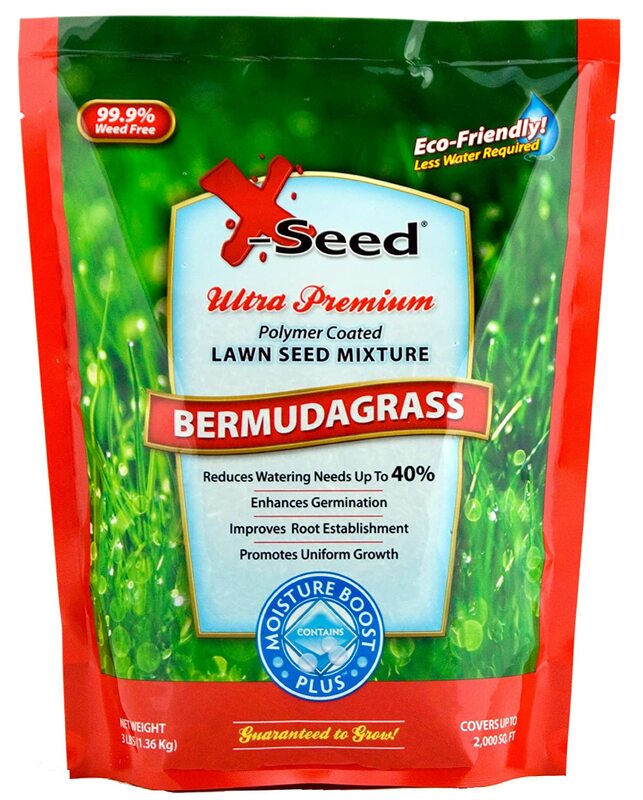 You are here: Home / Gardening / Grass Growing / How To Choose The Best Bermuda Grass Seed? How To Choose The Best Bermuda Grass Seed? As you want to know more about grass seed, you usually run into a problem about whether you would like warm or cool season grasses. If the warm season grasses are your favorite choice, let’s look more at the best Bermuda grass seed now. Known as the warm season grass used widely in the country, Bermuda grass can be used to serve many purposes such as for golf courses, lawns or athletic fields. In addition, with its vibrant green color, thick growth and fine texture, it is also seen as a wonderful choice for those who live in warm regions. 2 Why should you Choose Bermuda Grass Seed? 4 How to take care of Bermuda grass lawn? 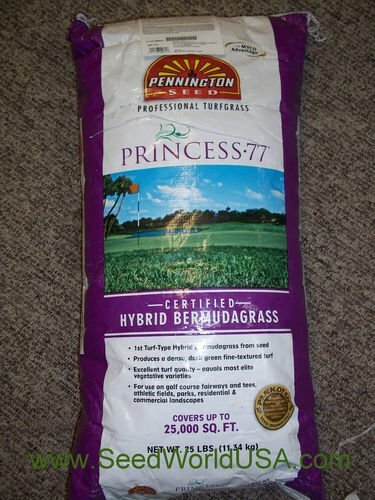 5.3 3.Pennington Premium Blend Bermuda Grass, 5 lb. The important thing is that you have to know how to pick up the grass seed which is suitable for growing your lawn. It is known that grass seed is usually sold under the form of a single type or a combination of different types. Most of turf grasses are generally perennial grasses, which means that they return every year. Most of the lawns are a combination of two or more types of grass. The seed mixtures bring about some certain benefits because they can build on the strengths found in each grass. In addition, the deficiencies of one grass can be made up for by others during the process of stress. One thing you need to notice is labels because they will show the type of seeds as well as some other materials. You should be careful that you may not find what you want because “quick grow” grasses often include annual grasses. The most important thing is picking up the fresh grass seeds. Remember that all types of grass seed more than 9 months are considered outdated. Besides, you also can know the rate of seed that is likely to produce the grass through the germination rate on the label. It is suggested to choose the seed with the minimum rate of 75 %. Make sure that your soil is checked before buying the grass seed. It is suggested that you make choice of the grass seed which is ideal and able to develop a lackluster lawn even though the pH level of your soil is incorrect. It is common that most types of turf grasses will grow strongly in well – aerated soil in which the pH level is slightly acidic (from 6 to 7.5). You need to prepare a soil test kit that can be bought from the local extension office. In order to carry out a soil test, you also have to collect some soil samples surrounding the place in which you seed. Then, make the soil mixed and put it into a soil testing bag. The price for each test is at least 15 dollars (it may change depending on region). You will have to wait for two weeks to receive the results. However, adjusting the soil may take more time. Accordingly, you will make a plan in order to seed but not test your soil right before seeding. Turfgrass is divided into 2 main categories including cool season and warm season. Warm season grass is originated from the South and thrive best under hot weather. As its name suggests, most of the warm-season grass won’t grow and will turn brown if the temperature is cool. Therefore, the right time to plant this kind of grass is late spring. Meanwhile, cool season grass is featured by rapid development in the fall and spring and often stems from the North. It will turn brown if the temperature is at a high level, especially in the summer months. Thus, it is better to grow cool season grass in the early autumn or late summer. Some popular warm season grasses can be listed as Zoysia, St. Augustine, Bahia, and Bermuda. One more thing is that warm lawns can reseed during the cold time for green grass around the year. For a few warm season kinds of grass, you only can plant them from grass sprigs or sod. An important thing to do when picking up a grass seed is considered the amount of damage possibly caused to your lawn. In case you have children who may step on your lawn, then don’t choose fine fescue because it can’t put up with being stepped on too much. If you want to find grass for athletic fields, Kentucky bluegrass is a right choice for you. Besides, this grass is self – mending and able to creep to cover the bare spots caused by damages. Remember that to make your Kentucky bluegrass look best; you need to water, fertilize, mow and take care of it more carefully. Providing water for your grass seed also needs to be considered. If the place where you plant your seed is possibly affected by water restrictions and droughts, then you better choose some grass like buffalo, zoysia or tall fescue grass. One of the grass that can stand up to drought best is Floratam of the St. Augustine variety, but the shade is required. In case you want to grow Kentucky bluegrass, then water needed to provide regularly to keep the lawn healthy. Every grass will require their own levels of shade. In general, most types of grasses also need to expose sunshine at least in 6 hours to be able to develop. Besides, some shade – tolerant grasses require 4 hours of partial or dappled shade to thrive. Some shade – tolerant grasses belonging to the category of cool season grass include tall, fine and rye fescues. Warm season grasses requiring shade consist of St. Augustine and zoysia. A good mixture of seed to create the shady grass should contain some different categories of shade – tolerant grasses. In case one grass does not succeed, then there will be an alternative. It is advised to select a seed mixture with perennial ryegrass at high rate if you intend to seed at a sloping place. Noticeably, it only takes a short time for this grass to germinate and develop. While its root system thrives rapidly, contributing to reducing the erosion, other types of turf in the blend will establish. Make sure that you do not buy a seed blend which includes over 20 % of perennial ryegrass or prevails much more than other grasses. It is necessary to use a blend because it can protect your seeding bet effectively. When choosing the grass seed, you should pay attention to the lawn maintenance. While some grasses are not required to mow regularly such as fescues, others like Kentucky bluegrass lawn needs to do so. For some warm season grass, Bermuda and centipede grass needs mowing more regularly than zoysia. Meanwhile, some types of native lawn hardly need mowing such as buffalo grass. Turf which has difficulty developing during the period of winter chill or summer heat needs less mowing in the dormancy. Therefore, it is important to consider all factors before choosing the grass seed. Remember to learn carefully about the fertility level your turf needs. If you are in favor of organic fertilizer such as compost or earth-friendly brews, check how the selected grass react to your fertilizer program to ensure that your seed can develop well. It is necessary to provide frequent fertilization for some certain turf. Finally, regardless of the grass category you choose, it is best to select one under one percent in the weed seed content and under four percent in the inert material content. Remember not to choose grass seed whose germination rate does not reach 70 % under any circumstances. Why should you Choose Bermuda Grass Seed? In spite of such name, this type of grass does not originate from a place like Bermuda but India. Therefore, it can be said that this grass is likely to live well in a particularly hot region in the world, let alone under warm condition. If you intend to move to southwest Missouri, then hot summers here will be an ideal environment for this grass to develop. One of the important features of Bermuda grass is resilience. You may run into Bermuda grass on some athletic field, a golf course, or someplace which suffers traffic a lot. However, do not worry because this type of grass can put up with damages well. In addition, it is difficult to tear it up, and it also grows back quickly if it does. Compared to other grasses, this grass is much more drought – resistant. Thus, you don’t have to get worried if a drought happens. Another advantage of Bermuda grass is that you can grow it easily. If it is planted at a place which has nearly no shade in warm seasons, you will worry about nothing because it can look after itself during its growth process and you have little to do. In comparison with other types of grass, Bermuda grass requires less fertilization as well as water. Moreover, Bermuda grass seed can adapt to many different soil types and is cheaper than many grass seeds. As planting Bermuda grass, you also will have more free time and work less. A disadvantage of Bermuda grass is that it has to be provided with full sunlight to be able to develop well. So if you only offer partial sunlight, then it can’t perform well. Another thing is that its growth rate is very high, so you will have to do the mowing regularly to control thatch effectively. A good way to stop a handle from accumulating near the soil and get it on the thatch is bagging the clippings. Although this grass type may be easily damaged by nematode injury which can deteriorate the root system and then make it ineffective and shallow, it is resistant to some certain diseases. When this grass is planted, it is difficult to control its spreading. With the system of stolon and rhizomes, it can stretch easily and quickly all directions. One thing you need to remember is that you should carefully prepare the soil if you want to plant grass seed in a new area. Firstly, utilizing a garden tool which is safe enough to wipe out weeds, rocks, stones and existing plants on your soil. Secondly, stir the soil with some kinds of organic material, which play an important role in retaining water for the soil and raking it smooth. Thirdly, spreading fertilizer over the soil with a view to helping the new grass strongly grow and improving germination. Lastly, sowing the seed of grass equally on the prepared soil in all four directions. Remember to rake the grass seed just into the top 1/8 of soil. If you do not want to sow grass seed by your own hand, utilize a lawn spreader instead. Cover the area which has just been seeded with straw or fabric to protect moisture. Water the plant until the grass germinates, then water less but with a larger amount. When new grass reaches the height of 3”, take out the lightly mow and the mulch. As the grass is still not strong enough, protect it from animals or people by means of roping it off. How to take care of Bermuda grass lawn? Without taking care of the lawn, you will obviously not have a healthy lawn. You don’t have to do a list of complicated things, just by simple things in terms of daily maintenance; you will ensure the productivity and growth of the lawn. Bermuda grass is not difficult to grow, as it can be grown from sod or seed. With each season you need to apply a different care. For example, grasses planted in the warm season needs care in different time, while grasses in cool season peak in the autumn.The most suitable season to plant Bermuda grass is in the spring. After a long time of frost, grasses come out of dormancy and strongly grow up. Because Bermuda grass aggressively grows up, it demands more care than other kinds of grass. You need to fertilize it monthly when it reaches the peak. In addition, during this time, you need to mow it two times a week in order to keep Bermuda grass at its suggested height from 1 to 1 ½ inches. Although the grass can suffer from drought, it cannot develop during a long time of drought. You can add 1 to 1 ½ inches of water from supplemental irrigation or rainfall. Another thing you need to think about is soil pH. According to many experts, the best pH soil so that grass can grow best is between 5.8 and 7.0. The Bermuda grass can tolerate an alkaline condition more than 2. In overly acidic soil, you can apply lime regularly with a view to maintaining pH so that the grass can develop. In these areas, you can replace Bermuda grass by a centipede. As a result, you need to test the soil whether it is suitable for planting Bermuda grass or not. Scotts has done its best in taking what Bermudagrass provides; it even has created better results with Scotts EZ Bermudagrass. It is guaranteed that there is nowhere on the market that you can find such a thickly, green and fast-growing Bermudagrass than this one. Being a revolutionary seeding mix, it helps to care for the seed for you. As a result, you can grow beautiful and thick grass anywhere. Moreover, Scotts’ material is uniquely growing which is much like a sponge, being able to absorb water. Its material expands to encircle the seed in moist so as to create a protective layer. What you need to do is digging a hole, putting it in, watering it and letting it do its work. Another feature of Scotts EZ Seed is its being stickier. This feature plays an important role in decreasing the amount of seed washed away on sloped areas. This seed can survive in the severe southern conditions such as dry areas and sweltering heat. An ideal planting condition for this seed is in spring or early summer, the temperature is from 70 to 90 degree Fahrenheit, and there is no danger of frostiness. The Bermudagrass color can change to straw around mid-autumn. However, this phenomenon does not mean that your lawns are getting in problems. It is just a normal state when Bermudagrass enters dormancy. This kind of seed is not sold publicly expect in the South and Southwest of the US. Scotts Turf Builder Grass Seed Bermudagrass can be used in common with a rotary spreader, drop spreader or handheld spreader. There are even thousands of distinct seeds in the smallest bag. These seeds can turn into hundreds of weeds sprouting. However, you do not have to be worry. 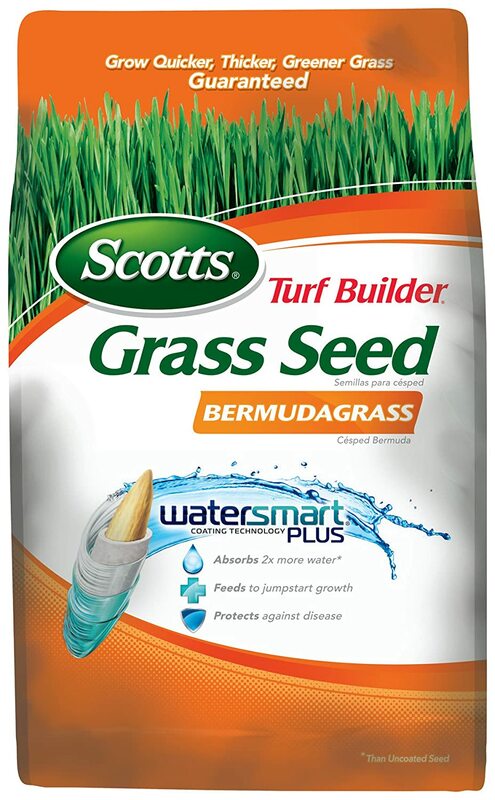 Scotts Turf Builder Grass Seed Bermudagrass is guaranteed that 99.9% is free from weeds. This means that they will grow well on appropriately surfaces. Scott’s WaterSmart PLUS Coating is used to treat grass seed for the purpose of feeding seeds with vital nutrients and preventing diseases. Furthermore, its water absorption and ability of holding are twice more than uncoated seed, which hinders the seeds from dying out even a day without being watered. 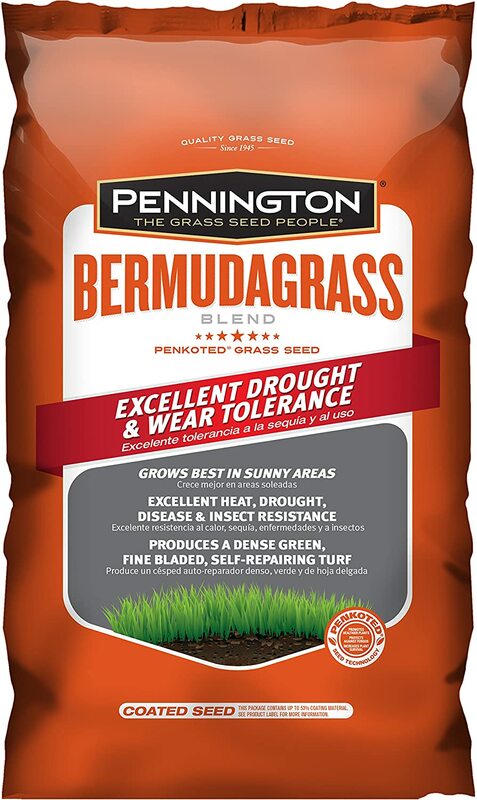 3.Pennington Premium Blend Bermuda Grass, 5 lb. Pennington is such an ideal combination of fertilizer and seed which is suitable for one-step application. Moreover, best working conditions of this type of seed are repairing gardens that have been harmed or necessarily reseeded lawn. 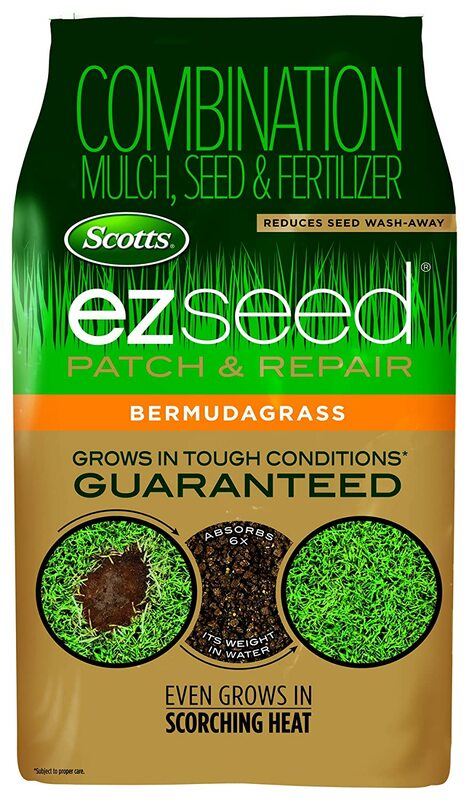 Patching tiny areas where the grass requires quickly establishment and a thorough ground cover in short time are perfect for applying this smart seed combination. Besides, this seed is easy to grow on any soil any ground, results in the first year and has no tilling or particular demand. Pennington is most appropriate for hot/warm climates and does not grow greatly in the cold/cool climates. Princess 77 Bermuda grass is the first textured hybrid and dense Bermuda grass which is available to use in the seeded form. Grass seed of Princess 77 Bermuda grass is used for variable purposes such as golf courses, parks, lawns and premium landscape. Another special thing about Princess 77 seeded Bermuda grass is that it is a combination of two elite parent clones. Thus it can be competitive with the vegetative hybrid Bermuda grasses in many fields: leaf texture, color, grass quality and density. In order to get the best result, you need to prepare the soil and abide to fertility recommendations before planting. It is advised not to cover the grass seed with too much soil. After seeding, you need to water the grass from 1 to 2 weeks to maintain the moisture for the root zone. From 7 to 10 days, the grass will germinate. The tolerance for drought is outstanding. The X-Seed Moisture Boost Plus Bermuda Grass Lawn Seed is easy to plant and take care of, so it is absolutely suitable for homeowners who want to have a healthy and beautiful lawn without putting two much effort to caring the lawn. Within 30 days of proper nourishment and care, you will achieve a dark green and lush lawn. I can be sure that you will extremely happy to see your result. Different from competitors, seed mixes of X-seed moisture do not contain low inert matter, weeds, as well as do not have noxious weeds. Additionally, they feature less than 10% annual ryegrass. The X-Seed is full of vitality; it can grow well in many kinds of soil. However, it cannot develop under direct sunlight. If you supply the grass with suitable amounts of water, it will grow beautifully and quickly. You are under guarantee to receive your money back if you do not satisfy with the result. So, let’s give it a try as you nothing at planting this grass. It is coated by a layer of polymer, which can retain water better. It is not suitable to plant indoor or under shade, only thrive in full sun. You have to treat each kind of grass with a different level of care. For instance, with Bermuda grass seed, how it should be maintained depends directly on its usage. When the grass seed is used for golf courses or athletic playing fields, there will be an increase in the maintenance level. Another case is when fields and lawns are regularly traveled; they demand much more fertilization so that they have enough nutrients to repair and grow, especially the area of grass has become thin. To conclude, if you have any tricks and tips for choosing the best Bermuda grass seed, don’t hesitate to share with us by comment below!